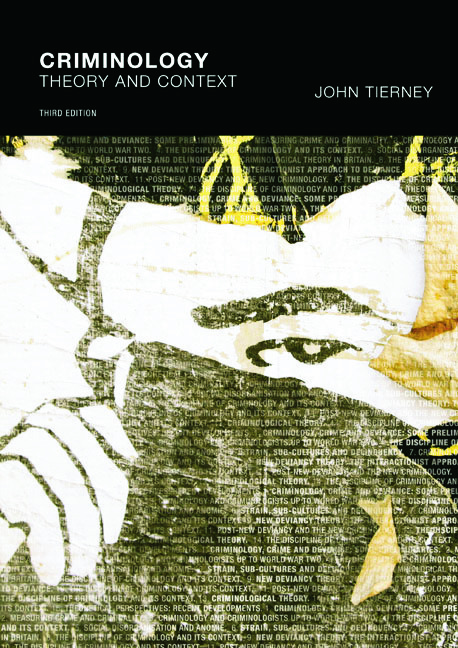 Criminology: theory and context, third edition, expands upon the ideas presented in previous editions, while introducing new material on critical theory, feminism, masculinities, cultural criminology and postmodernism. The text has been thoroughly updated throughout to reflect key perspectives in contemporary criminological theory. Relevant updates include discussions on New Labour’s criminal justice and penal policies in its third term in office, and the latest developments in criminal justice and the politics of law and order in the UK and US. This edition revisits societal and cultural influences that have shaped the discipline and invites the reader to re-examine the phenomena of crime and deviance. Criminology: theory and context, third edition, is presented in a logical structure and adopts an accessible framework. The text is essential reading for students of criminology, criminological theory and criminal justice and will also be of key interest to those studying sociology, law and the wider social sciences. Introduction Part I: Preliminaries and Early History 1. Criminology, crime and deviance: some preliminaries 2. Measuring crime and criminality 3. Criminology and criminologists up to World War Two Part II: World War Two to the Mid-1960s 4. The discipline of criminology and its context 5. Social disorganisation and anomie 6. Strain, subcultures and delinquency 7. Criminological theory in Britain Part III: The Mid-1960s to the Early 1970s 8. The discipline of criminology and its context 9. New deviancy theory: the interactionist approach to deviance Part IV: The 1970s 10. The discipline of criminology and its context 11. Post-new deviancy and the new criminology Part V: The 1980s to the Mid-1990s 12. The discipline of criminology and its context 13. Criminological theory Part VI: The Mid-1990s into the New Millennium 14. The discipline of criminology and its context 15. Theoretical perspectives: recent developments. John Tierney was a Lecturer in Criminology at Durham University.